For me, picking out the meat that I want to grill is easy…I own a meat market, and have a huge selection of the best cuts of meats to choose from. Where the challenge comes into play, is deciding what sides will best compliment the main dish. This is the perfect time of the year to visit your local farmers market for some fresh produce. Some markets have a “box of the week” which may include something you would not normally buy. This forces you to become a little creative with your dinner menu. That is what I love about it!! Sometimes I have to ask myself, how can I grill it?? But I always find a way!! Here are just a few of my favorite meat and veggie pairings. Whenever I grill steaks…you know I’m grilling a ribeye. I love to make melting onions as a side dish.I’ll simply throw the onions on the coals for about an hour or so, turning them every twenty minutes until soft. Once they’re soft, remove and let cool for a few minutes. Then, remove the burnt layer and slice into four pieces. Place the onions into a cast iron pan with butter, salt, pepper, and a splash of raspberry blush vinegar. Finally, return the pan to the grill to further caramelize. They are amazing!!!! Lamb rib chops are another one my favorites. With the lamb, I always grill zucchini andportabella mushrooms. I season them with salt and pepper, and brush with a mixture of extra virgin olive oil and balsamic vinegar. When the mushrooms are almost done, I top them with blue cheese for a little something extra!! I enjoy grilled potatoes, they accompany many different types of meats. I always try to find large Idaho russets, slice them length wise about 3/8” and brush them with olive oil and balsamic vinegar, then grill. Sometimes I’ll sprinkle shredded Parmesan cheese on them! The Gourmet BBQ System Wok is great for making zucchini. I slice the zucchini into strips about ½’’ thick and about 3’’ long. Season with salt, olive oil, and granulated garlic. Sautee for just a few minutes on high heat then, when they are almost done, I’ll throw in some chopped pecans. It goes well together with my grilled turkey keftedes (Greek meatballs)!! I always try to grill fish once a week. Salmon is my go to; it grills up pretty quick. It also takes about the same time as asparagus, which is why this is a great pairing. I season the asparagus with olive oil and kosher salt. It goes great with wild rice. Some of my other favorite veggies to grill include; corn on the cob, carrots, brussel sprouts, eggplant, peppers, and yes…even romaine lettuce!! 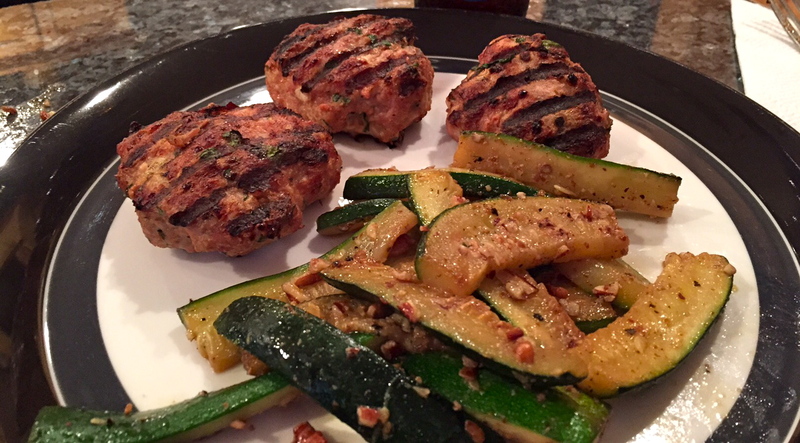 I enjoy grilling veggies almost as much as I do meat…Almost!!! !